There's a hoary adage about the best way to make a small fortune in the wine business—"Start with a large one"—that has a sad analog for those just wanting to get a college degree in hopes of making a decent living: start with a small fortune. Happily for those seeking to make a career in wine, local community colleges offer viticulture and wine studies for affordable tuition. Thanks to recently granted bonds, these departments are helping to pay expenses with their own brands of locally distributed wine. "It's no mercy purchase," assures instructor Bryan Avila. At Napa Valley College, his program trains budding winemakers in boutique production methods to meet specific profiles of the region's premium wine styles. It's a tall order, says Avila, for a winery with the worst turnover in the state. "Everyone leaves at the end of the semester." Recently, we sampled the latest from Santa Rosa Junior College's Shone Farm Winery (Swirl, June 22). Meanwhile, Napa Valley College Estate has released a slate of new wines and expanded its availability. While it's too late to pick up a nine-liter amphora of 2008 Cabernet Sauvignon, custom-thrown in the ceramics department and sold at auction, regular bottles ($35) of this plum-perfumed, serious Cab are still available. Light and bright, the aromatic 2010 Sauvignon Blanc ($18) toes the line between tropical and grassy, with zippy lychee berry fruit and a nice lift to the finish. Intentionally crafted to tutor students in the big, butterball style, the 2009 Chardonnay ($25) has toasty, buttered popcorn aromas but a breezy finish; while the 2009 Pinot Noir ($25) is soft and fruity, loaded with black cherry, cherry-vanilla cola flavors with a quenching orange peel twist. The cool-climate 2009 Syrah ($25) hits the right notes with distinctive, deli-meat aroma and deep blueberry flavor. The budget "10 Dollar Scholar," as Avila calls it, is no willy-nilly batch of odds and ends. The 2010 "Head Trained" white ($10) is a blend of Sauvignon Blanc and Chardonnay sexed up with Muscat, designed to entice with sweet aromas and drink like a light summer sipper. 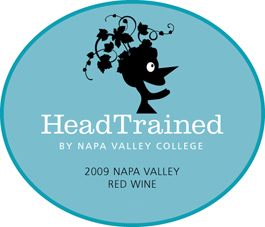 The 2009 "Head Trained" red ($12), with a sweet note of hickory smoke, is a deep, juicy red with a hearty, dry finish. Napa Valley College Estate wines can be found in Napa at JV Wine & Spirits (301 First St.), Val's Liquor (1531 Third St.), by the glass at Carpe Diem (1001 Second St.) and Bistro Don Giovanni (4110 Howard Lane) or online (for pickup at the college) at www.nvcwinery.com. Shone Farm wines can be found at locations throughout Sonoma County. See www.shonefarm.com for more info.